One of the greatest advantages we have over our competitors is experience. We have been in this industry for over thirty years. So whether you are locked out of your house or looking for the most reliable security system for your premises, Anytime Locksmiths can take care of all your needs. Do not hesitate to give us a call. We have earned a reputation in the industry by delivering the best customer service. At Anytime Locksmiths we update ourselves with the latest security concepts and state of the art security equipment to meet the diverse security needs of our customers. We are a trusted company for locksmith and security services, known for our professional and experienced staff at prices you can afford. We carry a large range of in stock to meet your specific security needs. At Anytime Locksmiths we strive to be very professional in our approach and we come up with the best security solutions for homes and businesses based on your security requirements and budget. We always keep in mind the best interests of our customers. Our team not only can help you in a lock-out situation, but we can consult and provide you or your company with expert locksmith services. Anytime Locksmiths provide excellent service at a very competitive rate and we are constantly updating our technology to ensure that we provide our customers with the most efficient and reliable service in the industry. Even if you simply need a key cut for your home or business we can help. If it has anything to do with lockout or locksmith issues we can help with almost any situation you can encounter. Call us today if you need help. Our team is standing by! Anytime Locksmith provides the fastest, most professional service 24 hours a day 7 days a week. Our locksmiths are experts at lockout situations and you can expect to be back in your home or office quickly. Call us any time and have a locksmith dispatched right away. Do you have any locksmith concerns in your home? Call Anytime Locksmith today. 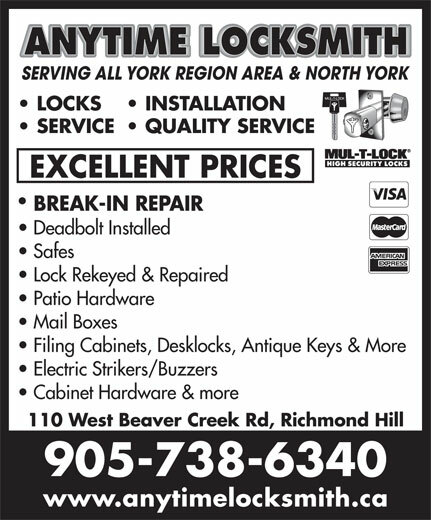 We are the best locksmith company in York Region. We have an emergency team of locksmith experts that will respond immediately. Our technicians are highly skilled and well equipped to handle all your residential locksmith problems any time of the day. We service all leading brands of residential security hardware and systems. While securing several doors can be as simple as installing locks keyed alike to operate with one key, other points of entry should be considered as well. Do you have basement windows or sliding glass patio doors that could be compromised? Installing window bars on basement windows is an easy and effective deterrent to this type of breach of your security. Some of these bars are also removable from the inside in case of fire to allow emergency exit. 110 West Beaver Creek Rd.